Experience a night of astonishing magic at State Theatre New Jersey with legendary comedic magicians Penn & Teller on Thursday, October 27, 2016! Penn & Teller are quite the opposite of one another. Penn (Jillette) is tall and loud with his dry comical delivery and candid opinions while Teller (a.k.a Raymond Joseph Teller), on the other hand, is short and quiet, staying silent for the majority of their performance. Before they became Penn & Teller, Teller was a Latin high school teacher who only did magic in his spare time and Penn was attending Clown College and was a juggler. It was in 1975, at the Minnesota Renaissance Festival, where the duo was first introduced to each other by Weir Chrisemer, a mutual friend and fellow magician. It was at the festival where the duo, along with Chrisemer, performed their very first show together. 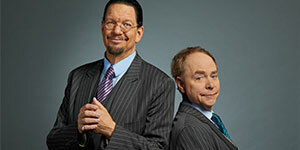 For 40 years now Penn & Teller have set themselves apart in the genre of magic while creating their own niche in comedy. In addition to touring, Penn & Teller have been performing at the Rio All Suite Hotel & Casino since 2001, making them one of the longest running acts in Las Vegas history. Recently, the CW Network has announced its summer premiere dates, which includes Penn & Teller: Fool Us featuring the How I Met Your Mother star Alyson Hannigan as the show’s new host. Returning for its third season in July, Penn & Teller: Fool Us is an hour long competition where aspiring magicians are invited to perform his or her best trick in an attempt to “fool” the magic duo. Anyone who succeeds earns the right to perform with Penn & Teller in their show at the Rio Hotel & Casino in Vegas. With sold out runs on Broadway, world tours, Emmy®-winning TV specials, and hundreds of television appearances, the pair shows no signs of slowing down. Come out to see Penn & Teller as they take the stage at The State on Thursday, October 27, 2016 at 8pm. Come on Down! 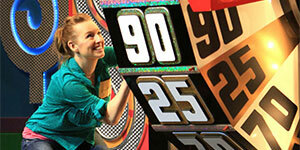 You Could be the Next Contestant on The Price is Right Live!